June/July has been a major swapping month for me, I am so lucky to be able to to try so many polishes I would never be able to purchase myself =) Swapping is just so much fun! Thank you to all the lovely ladies who responded to my post last month! Here is another wonderful swap for you that I did with the fabulous Inge from PolishSis that arrived this week. The polishes were all wrapped so beautifully. I didn't want to open them up however I did of course but very carefully! 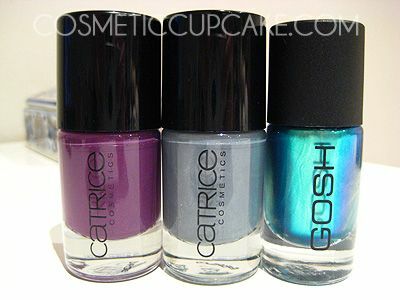 Catrice Plum Play With Me, London's Weather Forecast and GOSH Ocean. Isn't the GOSH stunning? I don't have any other blues like this so I'm so happy to add it to my collection. And more Catrice to play with yay! Hema polishes in 81, 82 and 205. 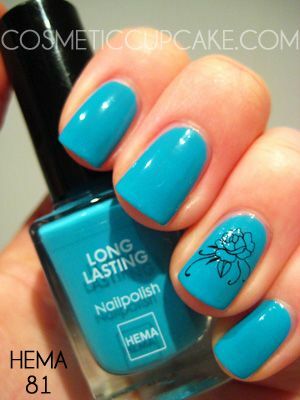 I've been lemming after Hema polishes for some time now after seeing them on Inge's blog. Thank you Inge for crossing these off my wishlist! Unfortunately I ruined my last manicure using Adamo 83 which gave me a great excuse to try out Hema 81. It looks like an unassuming but very pretty blue in the bottle, so imagine my surprise when I opened it up to find that it was a jelly!! It is absolutely gorgeous on the nail and I love it. Application was a dream and below is 2 coats for opacity. No clean up needed either! I didn't want to konad or do anything much over the top of this beautiful colour, so I just added a rose water decal from Viva La Nails on my accent fingers. If other Hema's apply like this and are just as gorgeous as 81 I want more >.< . Thanks for looking! Don't forget to enter my 200 followers giveaway here! It ends tonight so get your entries in! Oh, this is such a lovely swap! 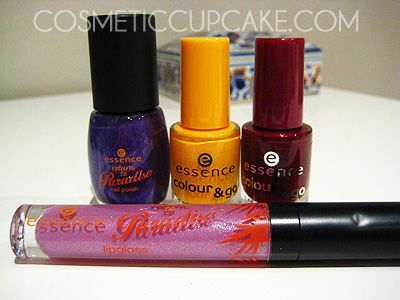 I'm especially eyeing those Catrice polishes, haha. 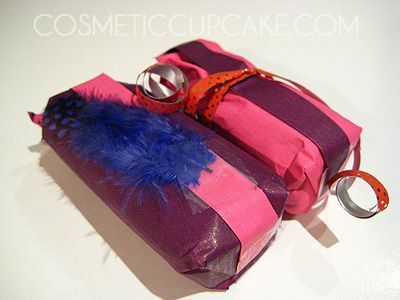 Just can't help myself when it comes to wrapping stuff, I often overdo it a bit, hence the colored feathers, LOL. I own the same Hema polishes, the blue and green are from the summer collection and I'm so happy with them that I bought them also for you. The blue looks great on you! Enjoy your polishes and if you ever see a dutch polish on my blog you need, you know how to reach me. And the wrapping, wow, I wouldn't want to open it either, it's so pretty. I think you'll be set for the next year on polish, how fun. 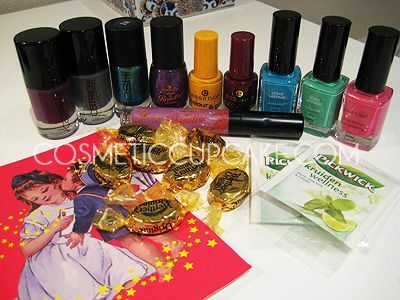 @shazzi: It was definitely a lovely swap with Inge =) I love Catrice polishes so much! I wish I could collect them all actually haha. @Inge: No it wasn't overdone at all! I love the wrapping =D I can't thank you enough for this swap, I love every single polish so much. I am so super impressed with Hema! @vampiressdoll: The Hema polishes are awesome =) The lipgloss is a very pretty purple, I'll have to swatch it soon! @Chris: I realised I did 6 swaps in the last 2 months! Omgish how crazy =p I totally need more fingers lol. @Bella: Strangely I still want more polish >.< I'm a polish addict! I have just awarded you with a blog award. Please visit my blog and check out your award. @Jackie S: It's an absolutely gorgeous polish definitely. I hope you can get your hands on it! Thank you for stopping by and commenting! @Ellis: Thank you so much for the award hun! Oof, that colour is lovely! And the Gosh blue looks like an amazing duochrome. :) You've been on such a swapping roll, but it's been fun reading about you getting new international brands. I love the blue one from Gosh! It's amazing! Hope the Return to Paradise collection come to Spain. @Joan: Yeah it's such a gorgeous blue jelly! I can't wait to try out the Gosh =p Glad you've liked reading about my latest swaps! WOw ! You're really lucky I wish I could have all those colors too! @Mlle Vanilla: Thank you so much for the sweet comment =) I appreciate it! @Saori: Swapping is such a lovely experience! You get to know so many great ladies from across the world and get to try fantastic polishes too!